/ CONTEXT Delsan AIM entered into an Asset Works and Purchase Agreement in 2014 to purchase and remove assets from the former Process Plant Area of the Brunswick Mine Site. The former zinc, lead, copper, and silver mine, which ceased operations in April 2013, was located on 1,030 hectares of land in northeastern New Brunswick, approximately 35 km south-west of the City of Bathurst. / CHALLENGES The location of the project presented some important logistical challenges due to record snowfalls that occurred for several months during the winter of 2014 to 2015. The sheer amount of snow had a major impact on not only the transportation of personnel to and from the site, but also site activities, since extensive removal operations were required just to provide safe access to work areas and to facilitate the decommissioning and demolition work. / DECOMMISSIONING In general, Delsan AIM prepared each building or structure for demolition by removing and disposing of any remaining hazardous materials that had been identified in the specifications, as well as confirming that all utilities had been physically disconnected to ensure the safety of demolition operations. The project included the cleaning and subsequent demolition of nine above-ground storage tanks that had been used for bunker C, diesel, gasoline, and waste oils. 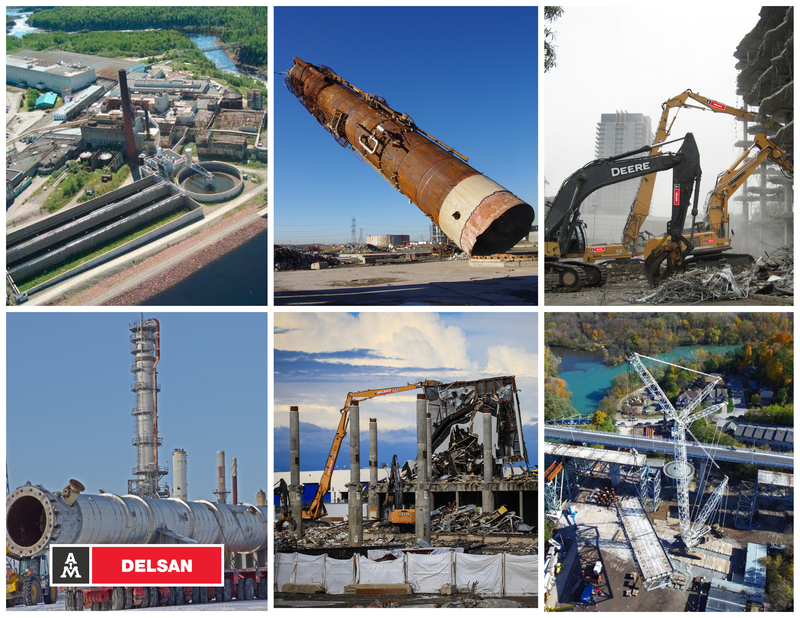 / DEMOLITION Once the decommissioning had been completed, Delsan AIM proceeded with the demolition and removal of the designated buildings and structures by employing mechanical methods using both a high-reach demolition excavator as well as conventional excavators. / CONTROL-DROP METHODS For higher structures that extended above the safe working level of conventional equipment, Delsan AIM also employed control-drop methods, either by mechanical means or by using explosives, in order to cause the rapid progressive failure of the structure in a predetermined, controlled, and secure manner. Specifically, Delsan AIM utilized explosives to safely and successfully demolish a headframe building. The building, which was located directly above the No. 3 Shaft and housed the hoisting equipment, was a large, reinforced concrete structure with a footprint of 68 feet by 46 feet, a height of 257 feet, and a wall thickness of 26 inches. The reinforced concrete floor of the building, which capped the top of the mine shaft, had to be maintained during the course of the work. / SAFETY FIRST This challenging demolition operation required careful planning, which Delsan AIM undertook by preparing a detailed Blast Plan, which included engineered procedures.